Always dreamed about being a spy? Then come to Commercenter Alabang on Saturday, December 8, 2018, and find out if you’re cut out to be one. 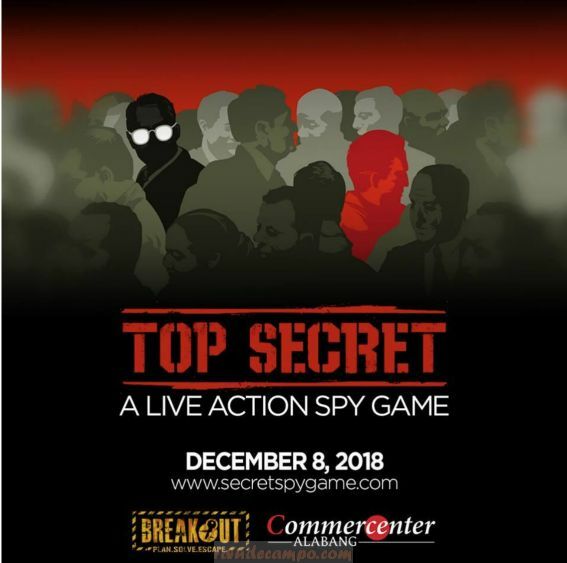 In partnership with Breakout Philippines, the mall is set to host Top Secret: A Live Action Spy Game once where the objective is not to escape from a locked room, but to ferret out an enemy in your midst! Put your detective skills to the test at Commercenter’s exclusive Breakout event! Two batches of 50 participants will be treated to two hours of intense, clue-finding fun. After an initial briefing, these would-be spies will pit their wits against each other, interacting with characters and tailing suspects to piece together the pieces of the puzzle before time runs out. They will have the run of the game arena, with objects of significance hidden in plain sight and clues tucked away in corners you’d never expect them to be in. Players are encouraged to pay close attention to their surroundings because once the game begins, everything is a clue and everyone a suspect. Actors will be mixed in with the regular participants, and they will be tasked with both helping and hindering players in their quest. To facilitate the event, Whodunnit kits will be handed out, complete with a set of complete game mechanics, accusation and evidence sheets, and a rundown of the scoring system. However, everything must be done incognito. Everything is so hush-hush that participants will be instructed on how to plant dead drops of important information: that is, to pass items containing secret information between two people such as a case officer and an agent, through a secret location. This way enables people who do not know each other to communicate without meeting directly. Players are encouraged to come in disguise. Just like real spies, the essence of the game is not to be caught or even recognized. If you’re one of the players, consider wearing sunglasses, a hat, or even a wig! You can even opt to stash an entirely new outfit to change into mid-game! At the end of two hours, participants get to submit their suspicions to an in-game detective to find out if they’ve cracked the case or ended up going on a wild goose chase. Come down to Commercenter Alabang for the chance to be the hero in your own spy movie. Who knows, you may discover a brilliant side of yourself that you’ve never known before.